Using photography to create a catalog of beauty was a great way of practicing being present, mindful, and grateful. It was also a nice exploration into looking at things from a different perspective and considering how shifting a vantage point might change one's experience with an idea, object, or person. I have been looking for some project ideas to do more perspective-shifting work with my students, and, as fate would have it, the perfect one came through my Facebook feed: #eyebombing. Watch the video below to learn more about the fun concept. I learned about #eyebombing when I happened upon an amazing HyperDoc assignment created by my friend, talented California educator, Lisa Highfill, based on a lesson idea by Adam Randall. HyperDocs are a transformative way of using collaborative technology, such as Google Docs & Slides, to create blended classroom instruction and engage students in learning activities. Find out more about HyperDocs here, or by reading Lisa's phenomenal book, co-authored with Kelly Hilton and Sarah Landis. This particular HyperDoc merged writing, photography, creativity and FUN! You can view the HyperDoc here (you can make your own copy if you are logged into your Google account - please maintain credit to the original creators in any copy that is made), or scroll through the Slides embedded below to learn more! What was extra exciting for me was the fact that in this assignment, perspective was addressed in two ways. First was the idea of looking for ordinary things and seeing how we could shift/add something to experience them in a completely different way - one that might create a moment of joy for ourselves and/or others. 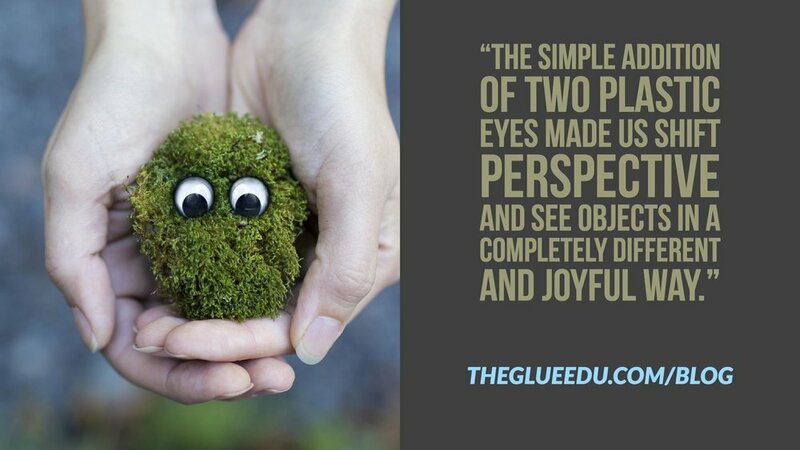 The fact that the simple addition of two plastic eyes made us see the object completely differently than we did before adding them was powerful in terms of understanding perspective shift. Second was the idea of writing a story from the perspective of the #eyebombed character. It made us think beyond our own feelings and try to understand those of another - fictional as they may be. These will be really great concepts to build upon in future lessons. For less than $3 (thank goodness for craft store coupons!) I was able to purchase a package of 160 self-adhesive googly eyes. This gave each student in my class six eyeballs (three pairs of eyes) to use to create characters. They worked in groups of 3 - each group having a camera to document their creations - and set off to #eyebomb our school. (*Note: I did email my entire staff the day before and let them know what I was planning so that nobody was caught by surprise). We explored different areas of the campus - inside and outside - and found so many fun ways to create "faces" on inanimate objects. The joy was palpable - everyone was giggling for two reasons: they were having a ton of fun creating their own #eyebombs and appreciating what their classmates were designing around them, and they were anticipating the smiles that would be brought to others' faces at recess when everyone came out of class and noticed the #eyebombs. It was a really enjoyable activity to be a part of and witness to. Check out some of my favourite creations from the project in the gallery below. So awesome! We are still working on writing and editing our stories in Google Docs, but I have no doubt that they will be as fun as the creations themselves! Have you done any activities with your students that help explore the idea of looking at things from a different perspective? Have you planned to create any moments of joy in your lessons and units this year? Please share in the comments below, or join our Facebook group and tell us your stories there! Your voice and ideas are important and valued. Please share! Addendum: Check out this amazing iteration of the HyperDoc that Gina Ripley created and shared out on Twitter after reading this post! Even better than the original! Also, check out this great vlog from Darin Nakakihara highlighting how he did this project with his 4th graders, and a fun interview with Lisa Highfill as well!